Improvisations for zheng and piano. 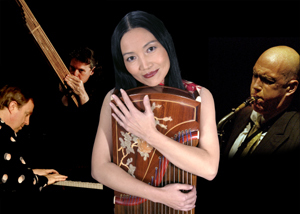 Informative, yet personal journey into Chinese music featuring scholar and musician Mei Han. Part One explores the roots of Chinese music. Part Two takes us through China's musical revolutions of the twentieth century. Mei Han was born into a military family during the famines that followed the Great Leap Forward in China. Life was harsh for Chinese then; food was scarce, political campaigns and fear were inseparable. Army life, in comparison with civilian society, was considered a good life, so many people joined to escape the misery. Mei’s family followed her father, moving from posting to posting. Once the barren gray concrete army barracks were replaced by a short stay in a luxurious villa infrequently used by Chairman Mao. Mei’s childhood was during the Cultural Revolution. At eleven, when the political winds shifted and traditional music was allowed to be taught again, she began her zheng studies with the celebrated Shandong zheng teacher Gao Zicheng (1918-2010) of the Xi’an Conservatory of Music. Gao was one of only a handful of traditional musicians who were representatives of their regional styles that were assigned to teach at music conservatories across the country. In order to take lessons with Gao, Mei took a long distance bus by herself along rough rural roads every week with a basket of fresh eggs, oil, flour, or rice on her lap as a gift for the teacher. As teachers were not allowed to accept money from private students, the food was greatly appreciated. At sixteen she was recruited by the army to begin her professional career with the opera wing of the Qianjin Song and Dance Troupe in Shenyang. Although far from home at a young age, the zheng saved Mei from “re-education” in the remote countryside. Two years later Mei went to study with Zhang Yan (1945-1996), the top contemporary zheng performer and composer in China at the time. These studies elevated Mei’s technique to a point where she applied for a highly sought after position of zheng soloist at the Zhanyou Ensemble, the leading group of its kind in China. Mei was offered the position, and at the age of twenty when most zheng players her age were entering conservatories, Mei found herself in the top position for the zheng in China. With Zhanyou, Mei toured for several years throughout China, to Inner Mongolia, along Russian Chinese borders, and the Greater Xing’an Range, the extreme northern forest of China, to visit remote outposts to do small concerts. She traveled with a troupe of 20 musicians and singers on old diesel buses whose wooden seats gave no comfort on the unpaved back roads of China. Infrequent relief came from boat trips up isolated rivers. Occasionally in the middle of their performances Russian helicopters would rise up on the other side of the border to see what was taking place. Following Deng Xiaoping’s policy of “Reform and Opening Up,” Hong Kong pop music swept through the country in the 1980s and increasingly influenced the Zhanyou Ensemble’s music direction. Mei felt lost artistically and started to look beyond music performance to expand her skillset. She attended an English school for four years and worked occasionally editing music books and translating ethnomusicological articles for Chinese music journals. In late spring 1989, Mei lived not far from Tiananmen Square. All of Beijing at the time was full of hope for change. On the evening of June 3rd, Mei sat in disbelief listening to gunfire throughout the night. At daybreak she ventured out to witness the horror at local hospitals filled with blood-soaked casualties. Mei’s belief in her country was shattered and her life forever changed. Mei’s eyes were open. She began to question the ideology that she had been taught. Yet options were limited and truth was illusive. So she began private studies in psychology. The idea of personal growth and personal choice began to influence Mei’s decision making towards her future. While continuing to perform the zheng for the international diplomatic circle in Beijing, Mei took rigid national examinations to enter the graduate program at the Music Research Institute, Chinese National Academy of Arts, where she majored in musicology. At the Institute, she not only studied Chinese music history and theory, but was also introduced to Western ethnomusicology. These studies distinguished Mei from other performers, as conservatory instrument studies offered only rudimentary courses on musical history and theory. Inspired by the idea of studying music of “others,” Mei chose as her research area the music and culture of the Dong, a minority ethnic group in southern China. In 1994, she traveled alone to 28 Dong villages, some located in extremely remote mountain regions and known for poisoning their guests’ food. Her respect to the locals and their culture won the trust and friendship from villagers at every stop. Her fieldwork was successful with rare audio and video recordings of a large number of musical performances, ceremonies, and festivals. This Dong research became the subject of her thesis for her first Master’s degree, which Mei received in 1995. In 1996, Mei came to the University of British Columbia, Canada to continue her studies in ethnomusicology, and in 1999 completed her second Master’s degree in Ethnomusicology. During her study at UBC, Mei frequently performed in school and for different communities in Vancouver, during which she performed several New Music compositions written by Western composers. Meanwhile, she began to learn improvisation with Randy Raine-Reusch, a multi-instrumentalist and composer. 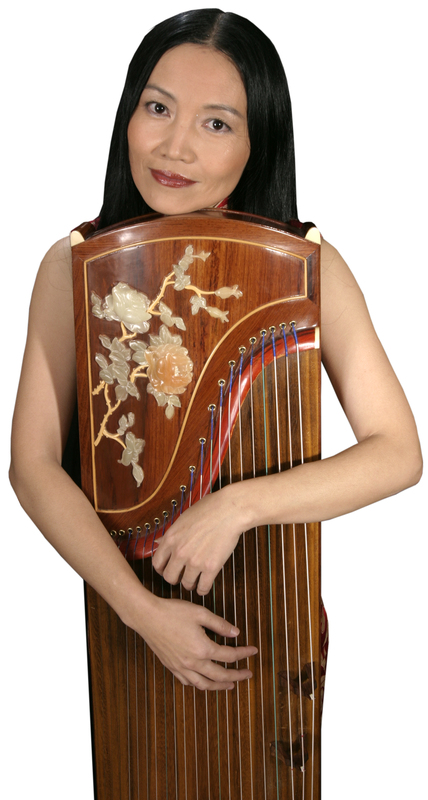 The enthusiasm for traditional Chinese music shown by western audiences, and possibilities to create new voices for her instrument, inspired Mei to pursue an international career as a zheng performer. In the last 15 years, Mei brought her past experiences to bear in the West to break musical boundaries, taking the zheng into a multitude of new genres, and developing radical new repertoires for the zheng, from cross-cultural composition, New Music, free improvisation, to electro-acoustic music. She has been touring internationally, performing with diverse names in music from Frank Gratkowski to Bela Fleck and Abigail Washburn, to the China Philharmonic Orchestra. 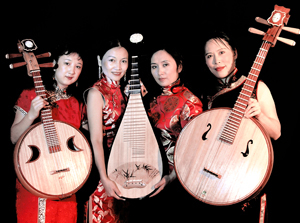 Mei has formed two groups, the Mei Han Art Ensemble and Red Chamber, and recorded eight albums. Mei’s approach to music is greatly influenced by the ancient Chinese aesthetics demonstrated by her early teachers combined with western contemporary innovations inspired by East Asian philosophies. 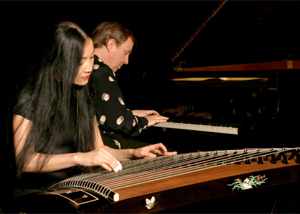 In order to gain a deeper understanding of the zheng’s history and contemporary horizons, Mei studied two instruments that were developed from the zheng: in Japan with Sawai Kazue, the leading contemporary koto exponent, who within the second lesson announced that Mei was no longer her student, but her sister; and in Vietnam with Bao Do Thi Phuong, the top dan tranh artist, who retains the old traditional nuances and techniques. In 2007, after having lived in Canada for ten years, performed around the world, and taught a number of courses at UBC and the Vancouver Community University, Mei felt it was the right time for her to step higher in the academic world. She enrolled in the Ph.D. program in ethnomusicology at UBC, which she completed in 2013. Her Ph.D. dissertation, entitled The Emergence of the Chinese Zheng: Traditional Context, Contemporary Evolution, and Cultural Identity, analyzes the traditional, 20th Century, and current transformations of the instrument and its performance, within a context of ancient Chinese aesthetics. This work is the culmination of her life’s work in the field as a scholar and performer. Mei is presently a Visiting Associate Professor at Kenyon College, a private and prestigious liberal art college in the United States, as well as an active performer.